Anchorage is Alaska's largest city and home to 280,000, roughly 40% of the state's population. Embraced by six mountain ranges and warmed by a maritime climate, Anchorage is alive year round with adventure, recreation, seasonal festivities, sporting events and more. From biking the coast line to shopping for the latest trends, this city offers spectacular views along with some of Alaska's favorite summer time activities. Backpacking, biking, hiking trails and fishing are just a few of the adventures available at your doorstep. For many of our guests Denali National Park is the highlight of their trip. At over six million acres Denali is about the size of Massachusetts and is the home of North Americas highest peak, Denali. At 20,237 ft, Alaskans refer to the mountain as Denali, meaning the high one or great one in the native Athabascan language. Coined the Golden Heart City for its residents and location in the heart of the state, Fairbanks is known for its rich gold mining history. It is a place of extremes, where the temperature rises into the 90s in the summer and can drop to 60 below in the winter. Covered by a blanket of snow in the winter and by rich green trees and foliage in the summer, it's hard to believe Fairbanks is a near desert, with just eleven and a half inches of precipitation a year. While in Fairbanks, guests have the opportunity to visit downtown with fine eateries and quaint shops, take in a variety of optional excursions including a flight to the Arctic Circle. The historic town of Girdwood, located 40 miles south of Anchorage, started as a mining community at the turn of the century. Originally known as Glacier City because of its picturesque location surrounded by majestic glacier covered mountains, it is a small community with a population of just over 2,000. Girdwood boasts fine restaurants, quaint shops and the perfect environment for outdoor activities. 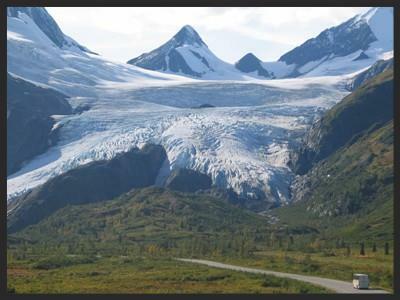 Valdez is located in South Central Alaska on the northeast tip of Prince William Sound. It is home to three historical events: an earthquake, registering 9.2 on the Richter Scale, struck 45 miles west of Valdez in 1964, which resulted in several tremendous waves that washed away the Valdez waterfront; thousands of people moved to Valdez in 1973 after Congress approved it to be the terminus of the Trans-Alaska Oil Pipeline; in 1989 the tanker Exxon Valdez struck Bligh reef, approximately 25 miles outside of Valdez, causing the largest oil spill in North American history. Valdez is one of Alaska's major ports, offering commercial and sport fishing, along with freight and oil shipping. Guests can enjoy the Valdez Small Boat Harbor and and explore Crooked Creek, a natural spawning area teaming with so many Pink and Chum salmon in July and August there is hardly room for the fish to swim upstream.